Continuing its long-standing tradition of naming different versions of its mobile operating system after popular desserts, Google today took the lid off the name of its most recent Android. Google confirmed that Android 9 or Android P as it was referred to will be named Pie, making it the shortest name for an Android OS yet. Android Pie is currently in its final phase of developer beta and is expected to go live on August 20. As is customary for two years now, Googles own Pixel 2 league of devices will be among the first to get the updates Over-The-Air with others like Samsung, Xiaomi, Oppo, Vivo, OnePlus, Huawei and many more to follow at their own schedules. As is also customary with these other devices, we’re at the mercy of device manufacturers to provide us with the necessary updates after they’re done laying their own skins over stock Android. The upcoming series of Pixel 3 devices set to launch sometime in October should be the first to get Pie out of the box. Even though Android Pie doesn’t introduce any earth-shattering improvements, it brings loads of nifty little enhancements and aids that will help users prolong their Android devices. Some of the more interesting developments are in the coveted Battery department with Battery Saver, which increases the battery’s longevity by switching off the Always-On display, Adaptive Battery which uses Machine Learning to adapt to your usage patterns resulting in more intelligent use of the device, Adaptive Brightness which learns your surroundings and the brightness levels associated with them so it can automatically adjust its display and Background Restrictions which allow you to place limits on the Battery usage of apps. One feature though is staying out and will be available only with the Pixel 3 devices come October. 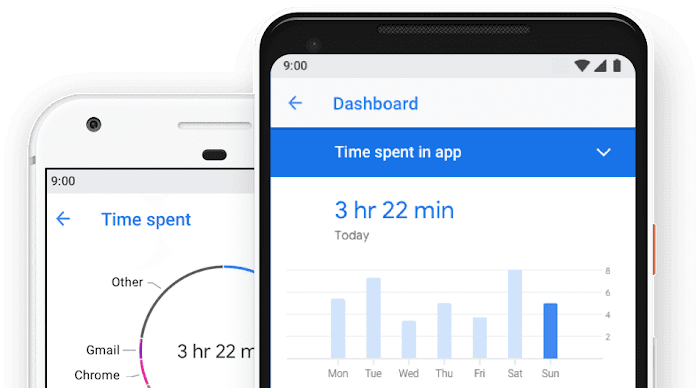 Dubbed Digital Well-Being, it’s an effort on part of Android to join the trend of ensuring responsible usage of smartphones by presenting an assortment of stats aimed at helping you monitor, and perhaps even curb, your smartphone utilization. The trend was kick-started largely with Apple’s efforts towards integrating these features in iOS 12 as was announced with the iPhone X, with social media sites Facebook and Instagram following suit as well. Display Cutout: Android 9 finally brings native in-built support for the infamous notch. Edge-To-Edge Screens: Android 9 supports the other major trend of longer 18:9 displays. Notification Enhancements: Messaging apps will support smart replies to be sent directly from the notifications panel. Always-On Display Support: Bucking in to trends, Android 9 supports always on displays out of the box. Slices: Probably the most intriguing feature, slices allows individual snippets or components of an app to be surfaced in search results for faster access. This prevents the need to launch an app every time you need to check something, further binding users onto Google’s own app. What do you think? After Marshmallow (Android 6), Nougat (Android 7) and Oreo (Android 8), are you satisfied with Google’s choice of name for Android 9? Let us know in the comments below.